This got forwarded to me just now. I read about that; it's terrible! I think in a way the 'moral' of the story is true. 'Too' refers to an excess, most things are better in moderation. Unless of course you do IB. haha jokes I would hate to be an employee at that firm! No-one even tried to contact him in 5 days is whats probably the most worrying thing. Wouldn't it at least smell just a little by the 4th day or something!? 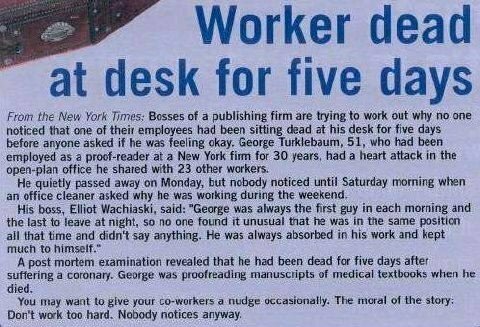 I find it disturbing, too, that 23 co-workers didn't notice he was dead but one single cleaner did. I don't think I could have believed that anyway. Wouldn't any of his family or friends have gotten worried? How did you find that website, by the way, Aboo? Not everybody has a family and regular contact to friends. Snopes is aces, debunks tons of rumours and chain emails. All I had to do this time was google the man's name. I agree. Some people are awfully lonely and no one would bat an eyelid if they went missing. Definitely not in a big city like New York. , it's not a coincidence that it aired at roughly the same time as this 'article' was put into circulation. This is pretty sad I have to say. Is this even a true story? I believe so, it was in the New York Times after all.